The speech of Dr.Manmohan Singh at Oxford University in 2005 reflects the intellectual slavery in the people who lead are country have. This is the grave misfortune of our country. While it must be said that he did mention a few things about the loot of India, the core of his speech was more damaging to the image of India and presents the rule of British in positive light. Dr.Singh says ” Of all the legacies of the Raj, none is more important than the English language and the modern school system. ” It is a pity that he states this. Mahatma Gandhi who he quotes in his speech, himself stated that the Indian education system was a Beautiful tree that the British destroyed. “If at all there is something most dangerous that the British have planted, it is the British Education system.”…..and the irony is that Dr.Singh acknowledges that very poisonous tree as the most important legacy ! ( Macaulay must be smiling in his grave at the success he has achieved ). Dr.Singh would do well to read the Beautiful Tree by Dharampal. This is yet another slavish statement. On what grounds does he state that the British gave us good governance. Lala Lajpat Rai’s – ” Unhappy India” and “England’s Debt to India” , Roots of Underdevelopment by Kusum Kedia are documentation on the loot that the British imposed on India. Not only Indians, but even Will Durant in his” Case for India” documents how the British destroyed this great civilization. 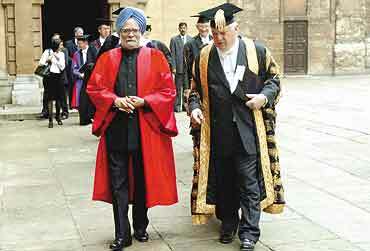 Dr.Manmohan Singh’s speech In acceptance of an Honorary Degree from Oxford University on 8 July, 2005. I must, at the outset, express my deep sense of shock and anger at the terrorist attacks in London yesterday. On behalf of the people of India, and on my own behalf, I convey sincere condolences to the families and friends of the deceased and the injured. I also extend the sympathy and solidarity of the people of India to the people of the United Kingdom, in particular the citizens of London. I arrived here in the U.K. after dealing with the aftermath of yet another terrorist attack in India. It is clear once again that terrorism is a global threat. Terrorism anywhere is a threat to peace, freedom, human dignity and civilisation everywhere. Terrorism is cowardice aimed at the innocent. It is fed on hatred and cynicism. Every time terrorists strike anywhere, all of us who believe in democracy and the rule of law must stand together and affirm our commitment to fight this scourge resolutely and unitedly. I sincerely hope that all those who cherish and value open and free societies will join hands in the war against terrorism, wherever it is fought. I wish the people of London well. I pray that their lives will soon return to normalcy and they can resume their celebrations for having been chosen as the venue for the 2012 Olympics. This is an emotional moment for me. Oxford brings back many fond memories that I cherish. For this reason, as much as for the intrinsic value of the honour you bestow upon me, I am truly overwhelmed. I am grateful to you, Mr Chancellor, and to your colleagues, for this honour. I have had the good fortune of receiving several honorary degrees. However, there can be nothing more valuable than receiving an honorary degree from one’s own alma mater. To be so honoured by a university where one has burnt the proverbial midnight oil to earn a regular degree, is a most fulfilling experience. I thank you for it. This is a day I will truly cherish. The world has changed beyond recognition since I was a student here. Yet, some age-old problems endure. Developing countries have found a new voice, a new status and have acquired a new sense of confidence over the last few decades. As an Indian, I see a new sense of hope and purpose. This new optimism gives us Indians a new sense of self-confidence and it shapes our world view today. It would be no exaggeration to suggest that the success of hundreds of young Indian students and professionals in Universities like Oxford, and elsewhere across the world, has contributed to this renewed self-confidence of a new India. The economics we learnt at Oxford in the 1950s was also marked by optimism about the economic prospects for the post-War and post-colonial world. But in the 1960s and 1970s, much of the focus of development economics shifted to concerns about the limits to growth. There was considerable doubt about the benefits of international trade for developing countries. I must confess that when I returned home to India, I was struck by the deep distrust of the world displayed by many of my countrymen. We were overwhelmed by the legacy of our immediate past. Not just by the perceived negative consequences of British imperial rule, but also by the sense that we were left out in the cold by the Cold War. There is no doubt that our grievances against the British Empire had a sound basis for. As the painstaking statistical work of the Cambridge historian Angus Maddison has shown, India’s share of world income collapsed from 22.6% in 1700, almost equal to Europe’s share of 23.3% at that time, to as low as 3.8% in 1952. Indeed, at the beginning of the 20th Century, “the brightest jewel in the British Crown” was the poorest country in the world in terms of per capita income. However, what is significant about the Indo-British relationship is the fact that despite the economic impact of colonial rule, the relationship between individual Indians and Britons, even at the time of our Independence, was relaxed and, I may even say, benign. This was best exemplified by the exchange that Mahatma Gandhi had here at Oxford in 1931 when he met members of the Raleigh Club and the Indian Majlis. The Mahatma was in England then for the Round Table Conference and during its recess, he spent two weekends at the home of A.D. Lindsay, the Master of Balliol. At this meeting, the Mahatma was asked: “How far would you cut India off from the Empire?” His reply was precise – “From the Empire, entirely; from the British nation not at all, if I want India to gain and not to grieve.” He added, “The British Empire is an Empire only because of India. The Emperorship must go and I should love to be an equal partner with Britain, sharing her joys and sorrows. But it must be a partnership on equal terms.” This remarkable statement by the Mahatma has defined the basis of our relationship with Britain. India and Britain set an example to the rest of the world in the way they sought to relate to each other, thanks to the wisdom and foresight of Mahatma Gandhi and Jawaharlal Nehru. When I became the Finance Minister of India in 1991, our Government launched the Indo-British Partnership Initiative. Our relationship had by then evolved to a stage where we had come to regard each other as partners. Today, there is no doubt in my mind that Britain and India are indeed partners and have much in common in their approach to a wide range of global issues. What impelled the Mahatma to take such a positive view of Britain and the British people even as he challenged the Empire and colonial rule? It was, undoubtedly, his recognition of the elements of fair play that characterized so much of the ways of the British in India. Consider the fact that an important slogan of India’s struggle for freedom was that “Self Government is more precious than Good Government”. That, of course, is the essence of democracy. But the slogan suggests that even at the height of our campaign for freedom from colonial rule, we did not entirely reject the British claim to good governance. We merely asserted our natural right to self-governance. Today, with the balance and perspective offered by the passage of time and the benefit of hindsight, it is possible for an Indian Prime Minister to assert that India’s experience with Britain had its beneficial consequences too. Our notions of the rule of law, of a Constitutional government, of a free press, of a professional civil service, of modern universities and research laboratories have all been fashioned in the crucible where an age old civilization met the dominant Empire of the day. These are all elements which we still value and cherish. Our judiciary, our legal system, our bureaucracy and our police are all great institutions, derived from British-Indian administration and they have served the country well. Of all the legacies of the Raj, none is more important than the English language and the modern school system. That is, if you leave out cricket! Of course, people here may not recognise the language we speak, but let me assure you that it is English! In indigenising English, as so many people have done in so many nations across the world, we have made the language our own. Our choice of prepositions may not always be the Queen’s English; we might occasionally split the infinitive; and we may drop an article here and add an extra one there. I am sure everyone will agree, however, that English has been enriched by Indian creativity as well and we have given you R.K. Narayan and Salman Rushdie. Today, English in India is seen as just another Indian language. The idea of India as enshrined in our Constitution, with its emphasis on the principles of secularism, democracy, the rule of law and, above all, the equality of all human beings irrespective of caste, community, language or ethnicity, has deep roots in India’s ancient civilization. However, it is undeniable that the founding fathers of our republic were also greatly influenced by the ideas associated with the age of enlightenment in Europe. Our Constitution remains a testimony to the enduring interplay between what is essentially Indian and what is very British in our intellectual heritage. The idea of India as an inclusive and plural society, draws on both these traditions. The success of our experiment of building a democracy within the framework of a multi-cultural, multi-ethnic, multi-lingual and multi-religious society will encourage all societies to walk the path we have trodden. In this journey, both Britain and India have learnt from each other and have much to teach the world. This is perhaps the most enduring aspect of the Indo-British encounter. It used to be said that the sun never sets on the British Empire. I am afraid we were partly responsible for sending that adage out of fashion! But, if there is one phenomenon on which the sun cannot set, it is the world of the English speaking people, in which the people of Indian origin are the single largest component. “The West has today opened its door. There are treasures for us to take. To see the India – British relationship as one of ‘give and take’, at the time when he first did so, was an act of courage and statesmanship. It was, however, also an act of great foresight. As we look back and also look ahead, it is clear that the Indo-British relationship is one of ‘give and take’. The challenge before us today is to see how we can take this mutually beneficial relationship forward in an increasingly inter-dependent world. Oxford has sent out many men to rule India. Some stayed behind to become India’s friends. Men like Edward Thompson, Verrier Elwin and many others are remembered in India for their contribution to our life and society. I always come back to the city of dreaming spires and of lost causes as a student. Mr Chancellor, I am here this time in all humility as the representative of a great nation and a great people. I am beholden to you, Mr Chancellor, and to my old university for the honour that I receive today. Thank you. This entry was posted in Nation and tagged British and Indian systems, decolonization, Dr.Manmohan Singh at Oxford University, Intellectual slavery in Indians on January 11, 2012 by arisebharat.